2:03 AM low -0.6 ft.
8:05 AM high 3.7 ft.
2:13 PM low -0.5 ft.
8:28 PM high 4.3 ft.
How to reach: To reach the tidal bench marks from the Methodist Church in Duck, proceed north along County Road 1152 for 1.6 km (1.0 mi) to the U.S. Corps of Engineers Coastal Engineering Research Center. The bench marks are located on the pier, in the parking lot, and along the pier access road. 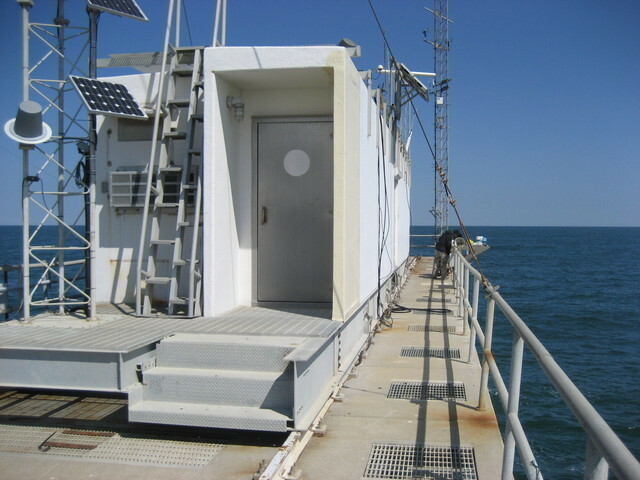 The tide gages are located on the offshore end of the pier in the NDBC trailer.